Link to screenshots of internal display of our Macintosh SE/30 which has our homemade clone of the Micron Technology 'Xceed Gray-Scale 30' adapter and the Micron Xceed Color 30 video card. Link to photo of homemade GrayScale adapter. 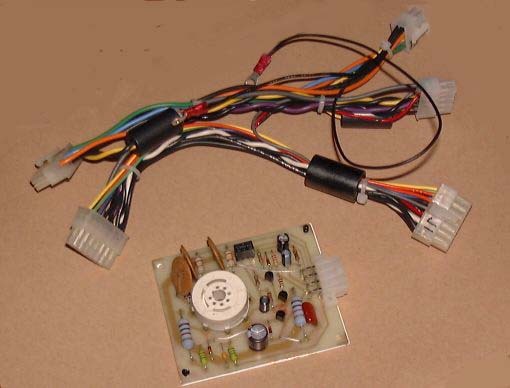 the standard Micron GrayScale Adapter harness. See the CRT base configuration picture here. the bottom then over on the left are the two sockets. ITALIC entries are guesses. n/a = not applicable. 640 x 480 (VGA) ?? F5R???? 2.01 ? MacroColor II NuBus n/a XCD-900004 F5R???? ? v2.0, 2.5, 3.0 NuBus n/a ?? F5R???? ? NB 824 NuBus n/a 16M ?? ?? F5R???? 1.00 ? NB6-48 NuBus 256 640 x 480 ?? F5R0306 2.01 ? NB10-78 NuBus 16M 1024 x 768 ?? F5R???? 2.01 ? NB12-108 NuBus ? 1280 x 1024 ?? F5R???? 2.01 ? NB-MR NuBus ? ?? ?? F5R???? 2.01 ? 640 x 480 VGA XCD-900006 F5R???? ??? ? 1152 x 870 XCD-900007 F5R???? ??? ? Identifying XCEED cards Many Micron Xceed video cards don't have marking for name or part number. The card's name will appear in the Options.. dialog of the Mac OS Monitors control panel. More information can be read from the card's ROM by using TattleTech 2.17 or TattleTech 2.59. This TattleTech 2.17 screenshot shows "Part#=0281", which in this case happens to be the last four digits of the card's FCC-ID number. The full FCC-ID is F5R0281. The FCC ID number is frequently marked. It is a 7 digit number that starts with "F5R". But Micron sometimes used one FCC-ID number for more than one type of XCEED card. main body text from the three messages I received. > but a little tricky to install. all, although installing the thing was a little nerve racking. than for the '30 without the card. That's all. in my SE/30 for the last 6 months. It actually works as expected. programs use the 9" screen without problems. bigger screen, this problem disappears. is also the most portable grayscale Macintosh. work, but it's a real bummer to fit in. I agree it's a great concept. your internal screen DOES work, but only in normal (1-bit) B&W mode. sell (yuk) or keep for the rest of your days in greyscale. at the same speed as the Quadra (with cache off). controls with the SE/30 cover open and the machine switched on. As I'm sure you've noticed I can strongly recommend the Eizo T240i monitor. run. Excellent with sys7- use one for the finder and the other for apps. as any "new" mac and will be for many years to come. who saves up most of his stipend for his Mac addiction. and that I have been of some help. An SE/30 with 256 shades of grey running OS 8.1!!!! Everything went without a hitch Steve, DAMN it feels good.